Continued from previous Ming Tomb Tour entry, we follow the path that leads us first to the left chamber in the Dingling tomb. As the name suggests, this chamber is located on the left side of the main chamber, and is symetrical to the right chamber. However, this chamber was empty when the underground palace was excavated. 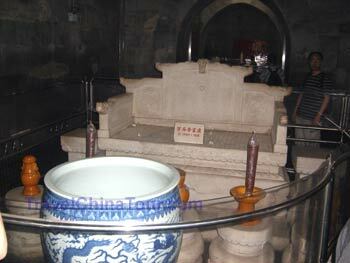 Photo of the left chamber inside the Dingling Tomb. The big pile you see behind the railing is a pile of cash that tourists leave behind - for reasons I'm not sure of. After the left chamber, the path leads the visitor to the middle chamber. The middle chamber did not contain any coffins, but in the center of it was the throne (made of solid stone) of the emperor with some sort of incense / candle infront of it. The throne of the emperor in the center of the middle chamber. The right chamber is not open to the public, so once we finished with the middle chamber, the path lead us to the rear chamber. It's in the rear chamber that all the coffins are located. Photo of some of the coffins inside the rear chamber. The photo quality isn't the greatest, since it was somewhat dark inside. The rear chamber is the main chamber of the underground palace. During the excavation, there was a coffin bed, on which the coffins of the emperor and empresses were placed. The coffin of the emperor was in the middle with the coffins of the empresses on the two sides. Researchers found jade materials between the coffins. They found 26 cases of burial articles that accompanied the emperor and empresses. The cofins and cases you see in the photo above are replicas of the originals. Which is why they look fresh, and vibrant in the picture above. 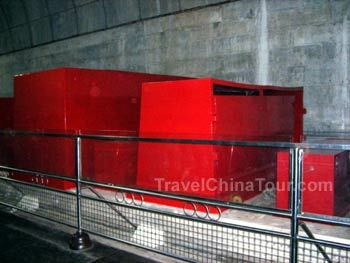 After we finshed touring the rear chamber, we exited through a large set of iron doors. The gate frame was carved out of white stone, and the door slab is 40cm thick at the ends, and 20cm thick towards the middle. After you walk through the last set of doors, there's a 4 story climb up to the top, and back into the scortching heat I went. Having climbed back to the top, we exit the rear to the soul tower. 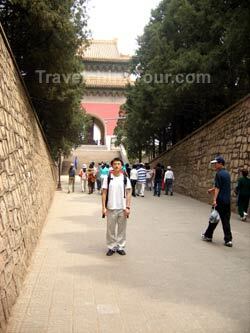 Photo taken from the rear exit of the Ming Tomb, and the large building in the back ground is the soul tower. The soul tower was built in 1587, and is a symbolic structure of the under ground palace. It's carved of stones decorated with colorful paintings. A sacred stone stele was erected inside the tower, and two chinese characters are engraved on to the top which says "Da Ming" meaning "The Great Ming Dynasty". While I was there, much of the color had faded, and it was quite difficult to make out the carved chinese writing on the stone tablet; however I was able to make out the Chinese characters. Afterwards I headed down the stairs to the path and courtyard where we entered from. 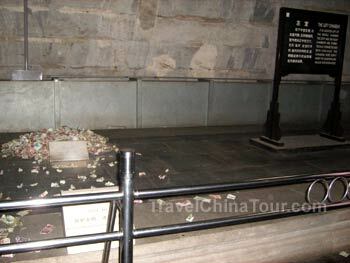 On the two sides are display halls housing various relics and artifacts recovered from inside the Dingling Tomb. 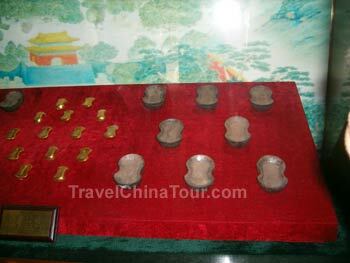 Various gold and silver ingots recovered from the Ming Tomb. Inside the Dingling Ming Tomb Museum, you will see all types of artifacts uncovered. The photo above shows silver and gold ingots recovered from the tomb; however I'm unsure if these are the originals or replicas... But my guess is probably replicas. Other relics includes various types of coins and currency, hair combs, make up accessories, various styles of hair pins, jade belts, different types of fabrics and clothing, pots and pans, and much more.